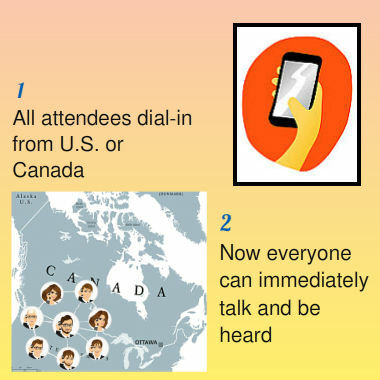 • All attendees connect to your call by dialing a toll-free or local access number from their location in Canada or the US. • The conferencing bridge instantly joins everyone together upon PIN entry. Canada conference calling can take several different forms. For example, the call's chairperson could be hosting the call from Canada attracting primarily Canadian participants. On the other hand, the host could be in the U.S. hosting a call with participants in both the United States and Canada. The key to making a economic Canada conference call is to find a conference calling service that offers low calling rates, toll free access and local dial-in numbers in both countries plus the service features and options that are most important to you. As an example, if you want to host a conference call and your call attendees are located in New York and Toronto, you'll need a service that can deliver both US and Canada toll free and local access numbers. Do you have participants in other countries? Accommodate participants located in 100+ other countries with toll-free and local country specific access numbers. View global international conferencing plans here. This plan is ideal for customers that require a full featured, high quality audio Toll-Free conferencing solution for use in Canada and the U.S.
No scheduling or booking is required. Simply send invitations to your attendees with time and date to dial-in. Optionally add sub-accounts for team members or associates enabling simultaneous use of your account for different groups or special projects. If you require more than one set of passcodes, we can provide as many set of codes as you require. Usage can be tracked by department or user id's for cost accounting purposes. Toll-Free dial-in for Canada and U.S.
Our Conference Call Canada toll free service is a convenient choice for any number of meetings, especially when participants are located in both the United States and Canada. Below are a few examples of common use cases for cross-border conference calls. It’s not uncommon for businesses on both sides of the US-Canadian border to interact with one another. Whether a company has branches in both countries or works with various suppliers, consultants, free lancers, clients, logistics companies, or authorities, holding a toll free conference call is an affordable, effective way to communicate with a large, diverse group. • One-to-many conference calls - Great for sharing information or trainings in “lecture only” mode. • Small group conference calls - A good choice for team collaboration, brain storming sessions, and strategy meetings. • Conference call recordings - Recording your conference allows you to share it with participants after the fact. The US-Canada Agreement on Government Procurement opened the doors to reciprocal projects and certain exemptions to the Buy American provisions of the US Recovery Act. Projects falling under the US-Canada Agreement on Government Procurement tend to be large in scope (for example, construction projects must have a total value in excess of $7,358,000) and subject to various limitations, which vary from one state to the next. • Regulatory conference calls - It may be necessary to speak with government officials, legal counsel, business advisors, consultants, and others in a conference call to determine if the project can move forward and establish the appropriate next steps. • Bidding conferences - Conference calls are convenient way to share information with bidders and answer questions. • General business calls - Conference calls are an important communications tool for project managers who must regularly interact with stakeholders and team members on both sides of the border. Conference calls are also an excellent tool for human resources departments who must provide training and guidance to employees located in the United States and Canada. By using a US and Canada toll free conference call service, employees can participate in a human resources conference call from any state or province at no cost to them. • Training a large cross-country work force - Rather than traveling to each location, a conference call allows trainers to reach the entire work force via a conference call. Conference calls reduce training costs and increase the productivity of trainers. • Creating a knowledge base with recordings from previous training conference calls - Each training-related conference call can be recorded and stored in a central location so that future employees can benefit from the material previously shared. • Company policy announcements or updates - Not only are conference calls a great way to communicate new company policies or clarify existing ones, your call attendance log can serve as proof that an individual participated in the conference call. For example, if an employee claims ignorance of a given policy, you could counter that claim with an attendance log showing his participation in a specific conference call covering that policy. • Recruiting - Conference calls are another option for sharing information about job openings to a group of potential candidates or recruiters. As the recruiting process gets underway, you can also use conference calls to prescreen individual candidates and hold preliminary interviews before investing in in-person interviews. Recording each interview enables multiple decision makers and hiring managers to listen in to your top candidates’ interviews as well. • Audio press conferences - Whether it’s an important new discovery, an urgent health warning, or a newsworthy medical item, holding a press conference via a conference call is an effective way to inform members of the press of all the pertinent details. • Physician consultations - On a smaller scale, physicians often use conference calls to consult with specialists or a healthcare team. The United States and Canada have a long history of collaboration. Using a toll free conference call service helps to reinforce those bonds while delivering all of the benefits of audio conferencing at an affordable rate.